The set length 179.3 Mm (7.06 In) provides the maximum spring pre-load. The set length 189.3 Mm (7.45 In) provides the minimum spring pre-load. turn the adjuster clockwise to stiffen the damping force and turn it counterclockwise to soften the damping force. Fine-tune the adjusters by turning it slightly until two punch marks align. 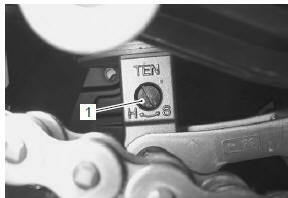 Fully turn the compression damping force (low speed) adjuster (1) clockwise. From that position (stiffest), turn it out to standard setting position. 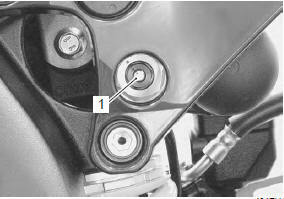 Fully turn the compression damping force (high speed) adjuster (1) clockwise. From that position (stiffest), turn it out to standard setting position.